You already know that oil prices are lower than they have been in a long time, in part because U.S. oil production is higher than it has ever been, and still climbing steeply. But you have to wonder how long these conditions will last, since lower oil prices make it less economical for oilfield services companies to drill. The below chart, courtesy of the oilfield services company Baker Hughes, may be the most dramatic illustration of economic reality you will see this month. It shows how the U.S. has increased the millions of barrels of oil per day that we’re pumping out of U.S. soil in the past four years. Looking at the orange line rising ever-more-steeply, you wonder whether oil prices will ever go back up to previous levels. But then you see the purple line, which tracks the number of active oil rigs that are out there looking for new sources of oil. 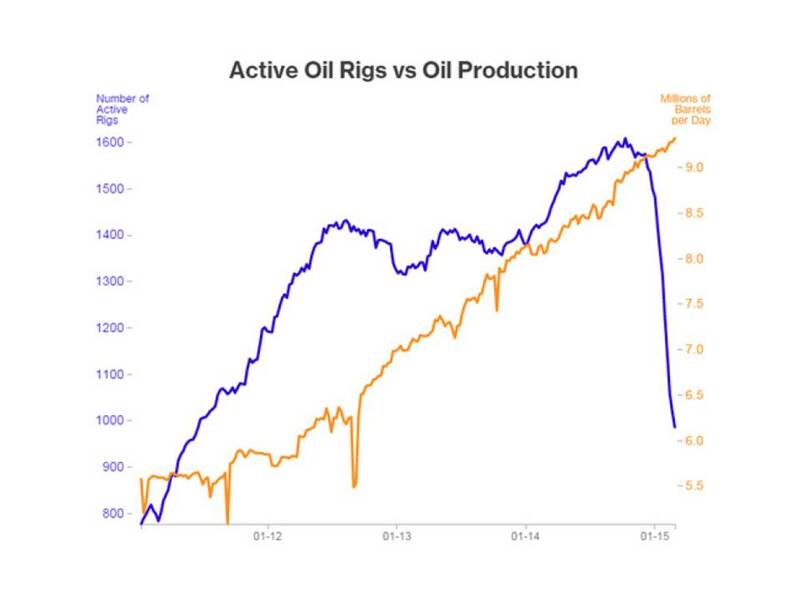 The last quarter of 2014 and the first few months of this year have created a dramatic bear market for drilling rigs in action. In just two fiscal quarters, the number of rigs in the field has dropped almost by half, and there is no sign that the trend is slowing down. What does that mean? Nothing in the short term, since the orange line represents existing production. But longer-term, you have to expect that fewer active rigs will mean fewer wells and, at the very least, a leveling out of that orange line. Oil prices may be down today, but that doesn’t mean supplies will outrun demand forever. Enjoy the low gas prices while you can. If you would like to review your current investment management portfolio or discuss any other financial planning matters, please don’t hesitate to contact us or visit our website at http://www.ydfs.com. We are a fee-only fiduciary financial planning firm that always puts your interests first. If you are not a client yet, an initial consultation is complimentary and there is never any pressure or hidden sales pitch. TheMoneyGeek thanks guest writer Bob Veres for writing this post.